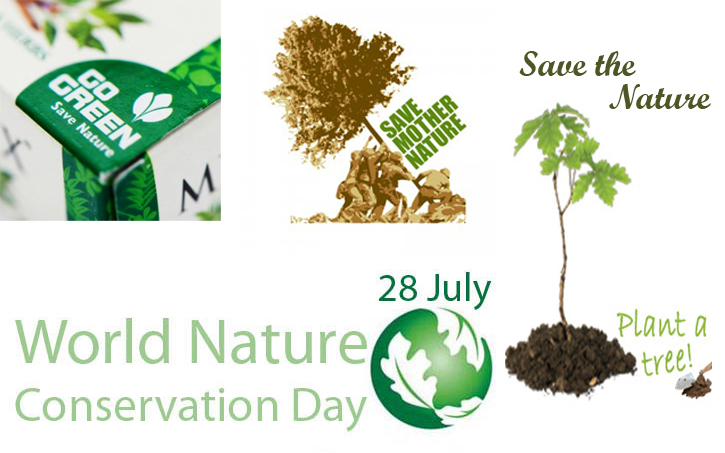 World Nature Conservation Day is observed on 28th July all over the world with the objective of increasing awareness about and protecting the natural resources that the Earth is bestowed with. . Nature provides us with various indispensable services which has made possible human existence on the planet. Every raw material required for the development process is being provided by nature. The rapid development process is putting pressure on the natural resources like air, water, forests, wildlife, fossil fuels & minerals. Excessive and unsustainable use of these resources is causing degradation of nature. Nature Conservation is the wise management and utilization of natural resources. Nature exists since the creation of the earth and we enjoy every bit of it till our soul leaves the world. But human beings have been cruel to nature and have destroyed it. Little is left for humans to enjoy. Nature has silently borne the onslaught on it. Little was realized that man would be paid back in their own coin to lament. The world is facing natural disasters in the form of earthquakes, floods, tsunamis and typhoons. Nature balances existence on earth but human beings have extracted the maximum and continue to destroy little is the realization that it is the cause of imbalance. To keep the balance in the natural world, we must also help various species to continue to exist. A report from the global conservation organization World Wildlife Foundation suggests that since 1970, the pressure that we exert on the planet has doubled and the resources upon which we depend have declined by 33 percent. Conservation of nature is very important, with scientists warning of mass extinctions in the near future. Many nature documentaries show resources that are being wasted. We have made this planet a world of steel and concrete to sustain humanity but at the cost of other species, and it has become more imperative upon us to conserve these resources that are vital to human survival. Trees and plants consume carbon which has increased the planet’s temperature, increased storms and sea level rises and freshwater glacier melting that threatens lives. Glaciers are connected to rivers and lakes which we depend on for drinking water through city/town/community services. Birds, bees and other insects pollinate the plants we need to eat to stay healthy nutritionally. Nature conservation ought to respect the natural environment and its intrinsic wildness. It is not about transforming wild animals into mere commodities that can be shot, farmed or gawked from behind a fence. A dedicated government policy and its strict implementation will go a long way in securing a better plane for conservation of nature and environment for future generations world- wide. It cannot remain any individual country’s responsibility to be concerned for the protection of nature and environment. It is the concern of each person to protect nature and environment. The day each person becomes conscious of his responsibility towards nature and environment, the world will be saved. For spreading consciousness among the people, observance of the World Nature Conservation Day on 28th July and World Environmental Day on 5th June each year is considered essential. Nature and environment need to be protected.